Jose Antonio Vargas, the former journalist who has spent the past few years crusading on behalf of fellow undocumented immigrants, was detained by U.S. Customs and Border Protection agents Tuesday and held for much of the day after trying to leave a Texas border town without a valid U.S. visa. Vargas was taken into custody Tuesday morning at McAllen-Miller International Airport and was held for about eight hours until his early-evening release. He received a notice to appear before an immigration judge. The high-profile and widely documented detainment came after the former Washington Post reporter made a series of public pronouncements that he might be trapped on the border. Vargas, 33, is a Filipino immigrant who has lived in the United States, without proper documents, since he was 12. According to DHS officials, a foreign passport is an acceptable primary form of ID for travel. TSA agents verify that the name on the ID “substantially matches the name on the travel document.” Agents, officials said, do not check immigration status. Vargas, perhaps the best-known undocumented immigrant in America, had gone to South Texas amid a border crisis that prompted the White House to request $3.7 billion in emergency funding. Vargas, founder of the nonprofit U.S. immigration-reform campaign Define American, tweeted Tuesday morning that he was about to go through security at the airport with nothing more than a Philippine passport and a pocketbook U.S. Constitution. “I don’t know what’s going to happen,” he wrote. Last year, Vargas testified at a Senate hearing on immigration reform. He also wrote and directed “Documented,” a film about his status as an immigrant without papers. In the documentary, Vargas says he dreams of getting a green card and flying back to the Philippines to see his mother for the first time since he was a child. Define American representatives said he was flying to Los Angeles for a screening at the time of his detention. Q: And now you have a real fear of not being able to get out of the area. Can you explain why that is and how it feels? A: I’m the most privileged undocumented immigrant in the country. And with that privilege comes responsibility. The responsibility of tying my specific story to the story of 11 million undocumented people like me and using every skill and resources I have to tell stories and insist that we talk about this issue humanely and fairly. The feeling of being stuck and trapped by our broken immigration system is very familiar to undocumented people like me. But it’s even more pronounced for undocumented immigrants who live in the border. And now I’m trapped like they are: There are check-points and border patrol agents everywhere, including at the airport. I’ve always felt trapped as an undocumented person who’s lived here for almost 21 years. And you make the most of what you can do. You try to stay positive. A: I have no control over what the government chooses to do. 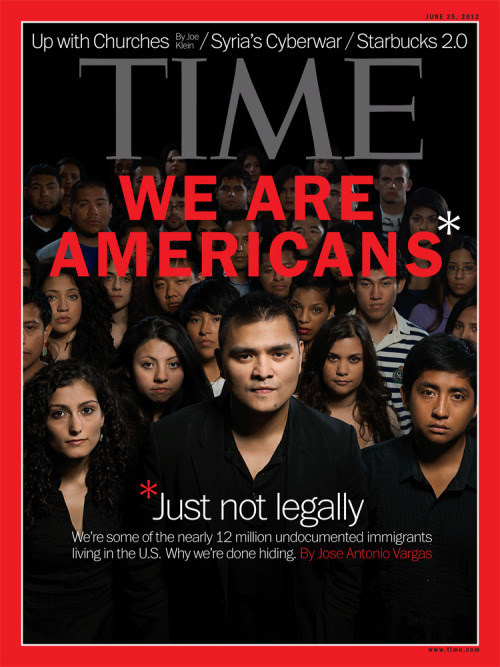 But like the other 11 million undocumented immigrants whose lives are in limbo, I am not a threat to this country. Should people continue to be needlessly detained and deported while our government can’t come up with a compromise and provide a solution? Vargas was a Washington Post reporter from 2004 to 2009 and was part of a team of Post journalists that won a Pulitzer Prize for coverage of the Virginia Tech shootings. As The Post previously reported, Vargas, a native of the Philippines, “never established legal status, even after he discovered his uncertain standing when he applied for a driver’s license as a teenager in California. He kept the secret while employed with a series of news organizations” — although he did reveal his secret to one senior editor at The Post, Peter Perl. Perl, who has retired from the newspaper, did not share the information with his superiors. Juliet Eilperin, Katie Zezima and Josh Hicks contributed to this report. This post has been updated multiple times. A previous version of this post incorrectly said that Define American was established to push for passage of the DREAM Act.